Once you’ve mastered payroll processing, you’ll have another procedure to learn: submitting payroll taxes. If you’ve been processing payroll manually, you know what a chore it can be to calculate your payroll taxes and stay current with those payments and filings. You also know that if you don’t properly go about submitting payroll taxes, you can face some major fines and penalties. Fortunately, QuickBooks and its add-on payroll services can simplify the grueling-but-necessary task of submitting payroll taxes. We’ll go over the most basic elements here, but we’d like to help you through at least your first set of payroll tax payments. You’ll definitely want to get them right the first time — and every time. Three Choices of Support Intuit offers three levels of payroll support: Basic, Enhanced, and Full Service. All three integrate easily with QuickBooks (or can be used as a standalone) and will calculate and generate paychecks (or orchestrate direct deposit) once you’ve entered the hours that W-2 employees worked. They also calculate your payroll taxes. The Basic version does not include forms, but you can print reports that we can use for filing. The Enhanced service adds 1099 paychecks, printing and e-filing of W-2s, and federal and state tax forms. It also supports e-filing and e-payment of payroll taxes. Full-Service subscribers additionally gain access to local tax information — and Intuit will automatically submit their payroll taxes. Payroll Setup Before you begin using payroll, you’ll need to complete QuickBooks’ Payroll Setup. This is a wizard-like, step-by-step tool that walks you through the process of entering all information required for payroll. (To get there, open the Employees menu and select Payroll Setup, which will open in its own set of windows.) One section deals entirely with payroll taxes. Using a series of fill-in-the-blank fields and drop-down lists, you’ll supply QuickBooks with the information it needs to calculate federal and state taxes. You’ll be able to add, edit, and delete default data. Figure 1: One screen in the payroll tax portion of QuickBooks. Here, too, you’ll be able to enter the names of the agencies that will receive payments, as well as specify the frequency that they’re due (quarterly, monthly, etc.). If you are using the Enhanced version ($28/month plus $2/month/employee), you’ll have to manage the payroll tax workflow yourself. QuickBooks will send you email reminders in advance of filing and payment deadlines. You can always check on the status of upcoming obligations, though. Open the Employees menu and select Payroll Center. You may already be familiar with this screen from doing payroll runs (accessed by clicking the Pay Employees tab in the image below). Click the Pay Liabilities tab. 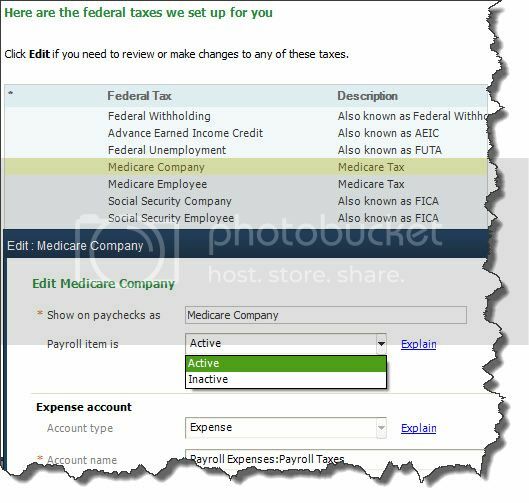 QuickBooks opens a table that displays not only payroll taxes, but other required payments, too, like health insurance. When it’s time to submit your current payroll taxes, you’ll click in the first column next to the payments you want to process. This will put a check mark in that column. Then you’ll click the View/Pay button to the lower right and either print the checks or process them electronically. Figure 2: The QuickBooks Payroll add-on calculates the payroll taxes that you must pay. 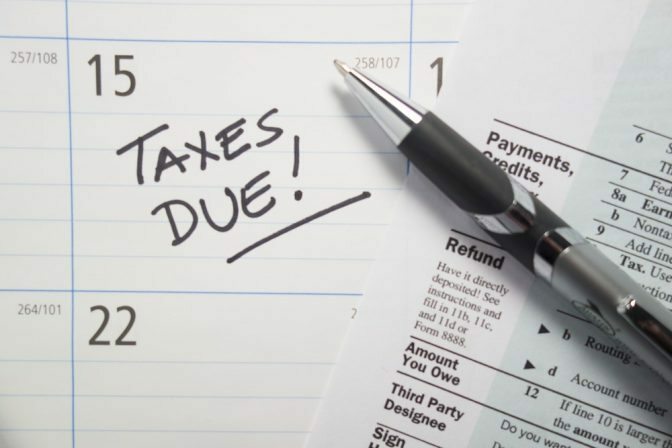 QuickBooks also directs you through the process of determining which payroll-related tax forms need to be filed, in addition to the payments required. You probably remember — or will soon learn about — all of the paperwork that needed to be filed when you hired your first employee. Much of that had to do with payroll, and all of it had to be absolutely correct. Between QuickBooks itself, your payroll add-on of choice, and related websites, you’ll have access to a good amount of support as you begin this arduous task. But we can’t emphasize this enough: It’s very important that you bring us into this process with you early on. There are some areas of QuickBooks where you can add information as you go along or get by with less than an absolutely thorough setup. Payroll is not one of them. Before you process your first set of checks and/or direct deposits, all of the pieces must be in place. And they must be precise. It’s bad enough to damage your relationship with customers and vendors through inaccurate bookkeeping and inaccurately submitting payroll taxes. But you must absolutely avoid making mistakes in your dealings with taxing agencies or with your most important asset — your employees — and their income.